When it became apparent that there where no centres of social activity for students in the area around the Sorbonne, a project to restore the “Ilot Champollion” was initiated in the early 2000s, but it never came to anything. last but not least, to give this place over to university and student life by creating friendly centres of social activity. 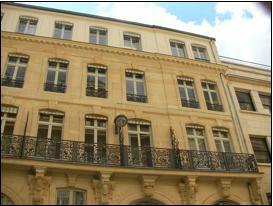 The “Ilot Champollion” is composed of the buildings located at numbers 13, 15 and 17, Rue Champollion and numbers 16, 18 and 18a, Rue de la Sorbonne. Originally, this set of buildings had a roofed passageway that ran through the buildings at 18, Rue de la Sorbonne and 15, Rue Champollion. It was opened in 1853, then closed in the 1960s. The restoration project concerns the whole building located at 15, Rue Champollion, a part of which is on the Register of Historical Monuments, and two floors of the building at 18, Rue de la Sorbonne. After validation of the pre-programming study, the project is now in its programming phase and the work is scheduled to be carried out over a 36-month period. create a 330 m² brasserie opening onto the Rue de la Sorbonne. create 17 rooms for researchers.